Planning villa vacations in St. Barths, the Caribbean, and Europe for over 30 years. cocktail made with Casamigos tequila, strawberry, ancho chili liquor and citrus. This summer Nantucket witnessed the rebirth of one of its landmark restaurants on Main Street, The Club Car. Aptly named due to its 19th-century railway car exterior (it’s an original car from the former Siasconset Railway), the hallmark eatery reopened its doors this May, revealing a thoroughly renovated, contemporary look, complete with modern luxury finishes (lacquer, brass and antique mirrors) and deep-seated blue banquettes. Designed by Nantucket native Tharon Anderson and executed by Dwyer Maloney of Main Street Construction, the aesthetic is what they call “vintage coastal,” a melding between the antique bar-car area and the vibrant, whitewashed dining space. Bridging the two areas is the beloved piano, preserved from the restaurant’s previous incarnation and now sitting proudly up front, offering both customers at the bar and those in the dining room a chance to join in the revelry. Equally indulging the melodious crowd is a special late-night menu and various large-bottle formats of wine. Serving dinner nightly and lunch Wednesday through Sunday, the 82-seat restaurant features Californian cuisine with a Mediterranean twist with multiple share-plate options alongside a tempting menu of sweet and spicy libations. The trio of partners behind The Club Car, Chef Mayumi Hattori, Ty Costa and Sommelier Tammy McDonough, are no strangers to the island, having worked together prior at neighboring Straight Wharf, and it is this shared passion for the island, its dining scene and, most of all, its people that has them eager to welcome you to the Club. tourists over the year, an 8.2% increase over the previous year, and it’s clear that the big luxury brand hotels took notice. First to come was the Four Seasons, which took over the Viceroy property late last year to the tune of a $10 million rebranding and expansion of the spa and gym. The second is Belmond, which, just this spring announced its purchase of the beloved GrecoMoorish-style property, Cap Juluca, located on the southwestern coast at Maundays Bay. According to CEO Roeland Vos, “This one-of-a-kind resort presents a compelling opportunity to build on our past experience of acquiring hotels that can be restored to iconic status through investment in the physical product and enhancement of all operational, sales, revenue management and service functions.” Belmond Cap Juluca will undergo a thorough renovation after the festive holidays, including an additional 25 new beachfront rooms and enhancements across the board from the spa to the public areas. The spend is approximated at $36 million and set to be completed by the end of 2018. We can’t wait to see what’s to come. CHECK OUT her embroidered cover-ups from Las Noches Ibiza by Eric & Jack. Back for her second year on Nantucket, boutique owner Joey Wölffer caters to those eschewing the conventional preppy style for more Bohemian flair. Her wharfside bolthole, located at 20 Old South Wharf, features limited designs in jewelry, clothing and accessories sourced by Joey from around the world. Standout pieces include Boho chic dresses by French designer V de Vinster, notice-me clip-on earrings from French designer Dominique Denaive, and Joey’s own line of handbags made from suede and calf leather. A Long Island native and partner in her family’s winery, Joey’s talent lies in selecting stylish yet effortless looks that are undeniably chic. The wharfside boutique that feels like a treasure chest. A suede Boho bag from the Joey Wölffer Collection. The Nantucket Project is about what matters in our noisy, messy world. We bring fresh ideas to curious audiences in live talks, short original films, and unforgettable experiences. $725 for up to two people; reservations@carlisle-bay.com. GOAT YOGA I T ’ S T H E L AT E S T F I T N E S S T R E N D T O SWEEP THE YOGA WORLD. Light Roll made with spicy toro, shiso and green apple topped with kiwi, ponzu and fresh lime zest. Nantucket’s infamous LOLA 41 and Station 21 proprietor, Marco Coelho, has expanded his empire to the metropolitan streets of Boston with his early-summer opening of LOLA 42. Located down by the seaport, at 22 Liberty Drive, this LOLA outpost features a similar menu with favorites like the Tuna Avocado Poke Salad and the beloved Lola and Tuna Burgers, while the seafront views keep the siren call of Nantucket still audible. Open seven days a week with lunch, afternoon and dinner menus, LOLA 42 promises to keep those needing a Nantucket fix on the mainland happily satiated. Something Special A NANTUCKET FAVORITE COMES TO GREENWICH, CONN. Beloved on Nantucket since 1970, Something Natural is a fresh, homemade sandwich shop and bakery with devotees as loyal as they come—evidenced by the ubiquitous lotus-like flower sticker you spy on cars both on- and off-island. Noted for its tucked-away residential location (and that congested driveway come August) as much as its chewy, freshly baked chocolate chip cookies and warm Portuguese Bread and Herb Rolls, the popular sandwich spot is as familiar to Nantucketers as the ferry’s horn. As a result, it was met with mixed emotions when their recent expansion into Greenwich, Connecticut, was first announced: natives cried commercialism while others worried bigger would dampen the specialness. Open since early July, in another tucked-away location behind Saks Fifth Avenue just off Greenwich Avenue, it’s virtually impossible to find fault with not only a small business’ success, but also with more daily homemade bread, cookies and brownies, not to mention Something Natural’s signature sandwiches (Sheila’s Favorite, Avocado, Cheddar & Chutney) in the world. The Greenwich location will also be serving new-to-the-menu salads such as the Cisco Caesar, 50 Cliff Cobb, Brant Point Bowl and Surfside Salad. They also offer gluten free bread and muffins for breakfast. And for those fortunate enough to visit both the Connecticut and the Nantucket outposts more than once a year, count yourself naturally lucky, indeed. Nothing quite defines an indulgent beach picnic like the right bottle of wine. Ever the intimidating subject, we’ve taken the hesitation out of your selection by rounding up a list of top picnic wines chosen by the top spots on island to grab them. pushed the club to take on more of an ambassador role of the area’s trails, working with local partners and property owners to showcase the immense terrain. We sat down with the area’s bona fide trail blazer to get a feel for the mountain biking culture and how visitors can grab a piece of the action. How did you get started mountain biking? I started mountain biking in grade school in the early ’90s, but I really fell in love with mountain biking during the summer of 2001 while living in northern California when I purchased my first full-suspension bike. That was a game changer—right tool for the job, if you will. Suddenly I was riding further, faster, and having way more fun than I ever had. As a crusty old snowboarder, I’ve found a lot of parallels between mountain bike culture and early snowboard culture—there’s an analogous DIY ethos that persists in mountain biking that I’ve always been drawn to. But ultimately, it’s just wicked fun! What is special about mountain biking in Stowe? Stowe’s trails are an alchemical mix of technical, smooth, hand-built, machine-sculpted and everything in between. There’s a great balance of beginner terrain and highly advanced terrain—one-hour lunch loops to all-day epics. Additionally, most of Stowe’s trails are purposebuilt mountain bike trails—meaning they were designed and built by mountain bikers with mountain biking in mind, as opposed to hiking trails or foot paths that have been co-opted by bikers. it too seriously. New riders tend to associate mountain biking with one of two things: spandex/all-day suffer-fest rides, or people tossing themselves off of cliffs and doing backflips. Those are, no doubt, interesting ends of the mountain bike spectrum, but for most of us that’s not mountain biking. What’s the best time you’ve ever had on your mountain bike and why? My favorite rides generally fall into one of three categories: the kind where we set out on a big ride, bite off more than we can chew, and sputter back to the trail head at the end of the day running on fumes; the kind that happens totally organically, when you run into a buddy randomly and just shred for a few hours; or the bike destination vacation that’s all about exploration and riding new trails. I’ve found though that the ride itself is usually just a backdrop to the experience that’s shared among a group of friends. I’ll admit that the first time I rode at Whistler Mountain Bike Park was a borderline spiritual experience. At what age do you think kids can start to mountain bike? Based on the crop of young rippers in this town, pretty young apparently! This year we started Stowe Bike Night, which is a weekly gathering of families and kids of all ages to ride bikes and just share a sense of community. Each week we see more and more kids, and both the age range and skill level are astonishing. What’s the secret to being a good mountain biker? Despite the many hours I’ve spent dissecting the technicalities and finer points, I’m still trying to answer that question myself—that’s part of what makes mountain biking great. Like golf or skiing/ snowboarding, mountain biking is instantly fun but can also take a lifetime to master. But if I had to take a stab I’d say that the two secret ingredients are: don’t take yourself too seriously, and just have fun. If you could design the perfect day of mountain biking on Stowe’s trails, how would it begin and end, meals included? It would definitely be a long day in the saddle. I’d start with an early latte at PK Coffee, hit up Commodities Natural Market to fill my pack with snacks, then set off from town, just a few close buddies traveling light so we can cover as much ground as possible. We’d pedal out to Sterling Forest, take a break at one of the stellar view points out there, then rally over to the new trails on the other side of the forest. We’d stop in midride for a snack and beer at the von Trapp Brewing Bierhall (there’s literally a mountain bike trail that connects from the trail network right to the brewery!). Then we’d finish with some hot laps in Cady Hill Forest, after which we’d jump on the Rec Path to consume our body weight in pizza, sushi and craft brew. There would, of course, be the requisite jump in the river along the way too. C O N T R O L T O W E R | FA R M . F I E L D . S E A . To reach this pool you must follow the marked trail head just off the right of Grand Fond’s pebble beach. The goat path climbs up the hill and along the coastline, requiring single-file walking. After roughly 20 minutes, you’ll spot the pool. Make your way down carefully as it is lined with sea urchins and rather steep. Regulars come well equipped, wearing sneakers and bathing suits, hats and ample sunscreen (there’s very little shade) plus armed with a towel and water. This path is less marked but slightly easier on the feet as it hugs the shoreline for the first 10 to 15 minutes. Begin at the small parking area at the end of the road on the right in Petite Cul de Sac. Take your first right and walk along the beach until it ends, then head up and over the hill, waving to the goats as you pass by. Be careful as you begin to descend on the rocky, windward side of the hill, maintaining around 20 feet between you and the water. Head straight and you will run right into the natural pool. pool near Petite Cul de Sac. Photographer Nathan Coe portrays an evocative avant-garde aesthetic in his new, limited edition fine art book, Nantucket.  WHAT IS IT ABOUT NANTUCKET THAT SUSTAINS YOUR CREATIVITY? Nantucket has an otherworldly nature to it, especially in the off seasons. The light and slithers of land against an enormous sky are so beautiful. Nowhere else has the skies we have here. IF HOME WERE NOT NANTUCKET, WHERE WOULD IT BE? Probably a deserted island with a golf course and mountains to climb. I haven’t found it yet.  YOU ALSO OWN NANTUCKET’S ONLY ORGANIC TAKEAWAY SPOT, NATIV MADE. WHAT DO YOU WANT PEOPLE TO KNOW ABOUT IT? The quality is second to none, and it’s all about the ethics and standards behind the food and ingredients. Plus, you can get anything depending on how you rolled out of bed: a cold pressed juice and healthy snack or a delicious pastry and cold brewed coffee.  WHO IS A FELLOW LOCAL ARTIST YOU ADMIRE? I admire Illya Kagan’s paintings. He really captures the color and character of the light and the Nantucket skies. NEXT PROJECT ON DECK THAT HAS YOU EXCITED? I’m planning an art series of photographs using a fashion vibe with a little tongue in cheek toward the island’s stereotypes and unique idiosyncrasies. from late July at nathancoe.com, $2,500. Fueled by a shared passion—which, for most of them, was found later in life—an intrepid crew of fifty-somethings have banded together in common pursuit of the best kiteboarding conditions they can find, wherever they may be. Decade-old pals and Greenwich, Connecticut residents Robert Greenhill, Brian Olson, Max Justicz and Scott Stuart have multiple things in common—similar-aged children, athletic dispositions, competitive spirit—but the one thing that has truly cemented their friendship is a similar affinity for the adrenaline-fueled sport of kiteboarding. Heralded as one of the most dangerous activities one can do—a kiter literally tethers himself to a large kite with nothing but a plastic board to ground him to the water—kiteboarding is anything but a leisurely pursuit. And like anything that flirts with mortal injury, those drawn to it are typically consummate thrill-seekers. Just ask this modern Band of Brothers, who recently sat down with Goodspeed to share advice, their expertise and even some tall tales from their global kiting adventures, which have taken them from Mozambique to Fiji to the Caribbean and back again, as they steadfastly search for the best possible breeze. From multi-family boat vacations to ensure they can adjust to changing wind conditions, to having their own personal meteorologist on call, to last-minute hops down to the islands, the appetite is fierce and, better yet, inclusive. As Greenhill says, “It’s more fun to share it with others and spread the sport around. Plus, newbies bring new energy and sparkle and get you excited all over again.” And what began as a men’s group has grown into an all-inclusive family sport, with kids and spouses now suiting up as well. As Stuart aptly put it, “Learning with your family is super special. What other sport can you all learn at the same time?” Stuart’s son Nate is equally as entrenched as his father, and is spending this summer coaching kiteboarding on Nantucket. On a group trip down to Necker Island a few years back, Brian Olson asked the host, Richard Branson himself, if he’d ever kited under a full moon. The second he acknowledged he hadn’t, he was rousing everyone to join him to anoint such an action. He didn’t even bother to change into a suit and went in fully clothed. Armed with individual EPIRBs and glow sticks affixed to their boards, the guys all headed out for a moonlit circumnavigation they’ll never forget. Everyone has had his fair share of uncomfortable landings or what feels like gallons of water up their noses. As Olson says, “Kitesurfing is like a free Neti pot,” but it was Bobby Greenhill who can claim the most stitches out of the group. He was down in Cape Hatteras, where Real Sports is located, when he crash landed in some shallow water; when he went to retrieve his board, he sliced his leg open, right to the bone, on some chicken wire from an old lobster trap. And since it was out in the field, per se, he got only seven marine stitches, whereas a hospital would have likely put in 30-plus. record, the group’s current highest jump stat belongs to Brian Olson at 38 feet, but all of them have recorded some impressive speed with 8 or 9G landings. When asked why they think the devotion to the sport is so universally strong, Justicz answered, “It’s a relatively small and undiscovered sport. The current generation of kiteboarders feels like a relatively intimate group of sporting pioneers—perhaps like surfing in the 1940s and 1950s before neoprene and Hollywood raised public awareness.” Furthermore, it’s about the shared experience. Olson calls it a “10 out of 10 for camaraderie,” saying, “For every day of kiting, you get a solid three hours of good conversation.” It’s clear the shared sense of exhaustion and accomplishment is a unifying element for not just physical fitness and competitive exhilaration but, most important, a longstanding friendship. When the kiter is attached to a wakeboard-like board, known as a twin-tip. When the kiter is using a surfboard to then surf and play in waves. When kiters can enjoy an effortless breeze going downwind and work on some tricks. It’s equivalent to off-piste powder skiing, as you can just jump and float. Classic crowded spots like Cabarete in the Dominican Republic. Warm water, high visibility, 20 to 30 knots of onshore breeze with protected flat water like Coatue beach in Nantucket Harbor or waves in the Outer Banks, NC. Take a 2-night test drive and youâ&#x20AC;&#x2122;ll see itâ&#x20AC;&#x2122;s love at first night. WINGS OVER NORMANDY One plane's journey across the Atlantic to participate in 70th anniversary D-Day memorial ceremonies. ©Lee Howard Photography Co. U.K.
Placid Lassie over the English countryside, on her way to the 70th D-Day Commemorations in Normandy, France—here in formation with a C-45. In the pre-dawn hours of June 6, 1944, thousands of brave Allied soldiers embarked on D-Day, the final invasion of Hitlerâ&#x20AC;&#x2122;s Fortress Europe. Fourteen of those troopers of the 101st Airborne Division rode the Douglas C-47 christened by her crew as Placid Lassie. Lassie, along with many of those troopers, survived the war and entered civilian life. The C-47 cargo plane was converted to a DC-3 airliner and plied the skies of North America for more than 50 years. Finally abandoned in a field in rural Georgia, Lassie was discovered by a group of enthusiasts and recognized for what she is: a proud war veteran deserving of respect and preservation. After a four-year restoration costing several hundred thousand dollars and countless man-hours, Lassie was one of two C-47s that braved the North Atlantic to honor and commemorate the sacrifices of 1944. In the morning hours of June 6, 2014, Placid Lassie flew again over the beaches of Normandy! Today, Lassie flies regularly with the same dedicated group of volunteers who pulled her out of the field seven years ago. She visits air shows throughout North America, bringing her story of heroism and resilience to younger generations. In 2019, America will mark the 75th anniversary of the D-Day Invasionâ&#x20AC;&#x201D; and again, Lassie will cross the pond, this time as the leader of the 75th Squadron, a group of a dozen or more DC-3/C-47 aircraft that will participate in the Normandy Commemorations. A successful video marketing campaign starts with creativity & strategy so when you launch it, you see results. Weâ&#x20AC;&#x2122;re more than a video production company. We understand storytelling & marketing and submerge ourselves in your world so that when we tell your story, we get it right. Tradewind Aviation was founded in 2001 on the premise that every flight deserves the highest-quality aircraft, crew and service. Headquartered at the Waterbury-Oxford Airport (OXC) in Connecticut with operational bases at Westchester County Airport (HPN) in White Plains, New York, and San Juan International Airport (SJU) in Puerto Rico, Tradewind operates 21 aircraft for on-demand private charter and scheduled “Shuttle” service throughout the U.S. and Caribbean. 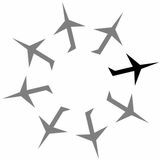 Tradewind Aviation has been awarded an ARGUS Gold rating, which is held by less than 20% of all US-certificated charter operators. As a scheduled air carrier, Tradewind is subject to a higher operational Dominica standard and increased scrutiny by FAA, DOT and foreign regulatory agencies as compared to the majority of on-demand charter operators. We would very much welcome the opportunity to provide our superior level of service for your next journey. Our flight department is available 24/7 and happy to assist you. Contact us today! Tradewind’s latest pick for where and with what to best toast the sunset Nothing quite tops off a good day like a delicious cocktail in hand, seated in a prime venue for admiring the sky as the sun bids its colorful adieu. Fortunately, Tradewind flies to some of the most spectacular spots in the world for enjoying such a relaxing ritual. Below is one of our favorite spots with the tasty cocktail of choice. The recipe is included for you to re-create the ritual at home. BONITO | ST. BARTHS RECIPE 1.35 oz. (4 cl) vodka 0.67 oz. (2 cl) saké 0.33 oz. (1 cl) lime juice 1.35 oz. (4 cl) purée litchi 1.35 oz. (4 cl) coconut cream DIRECTIONS Pour all ingredients into a shaker with ice. Shake vigorously for best froth—and serve creatively! 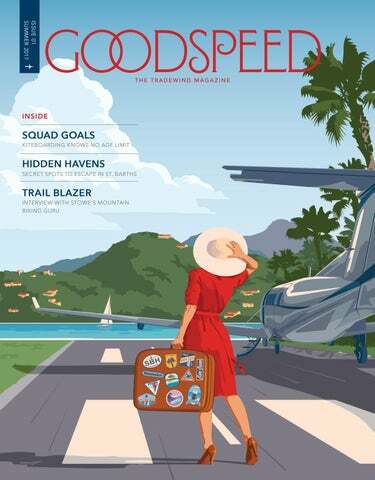 A new luxury inflight magazine from Tradewind Aviation, highlighting the latest and greatest from their distinct destinations.